An artist’s impression of the bungalow unit to be launched by Mah Sing in Batu Maung. GEORGE TOWN: Mah Sing Group Bhd is bringing forward to the next two to three months the launch of its bungalows for the RM1.35bil Southbay Penang mixed development project in Batu Maung. 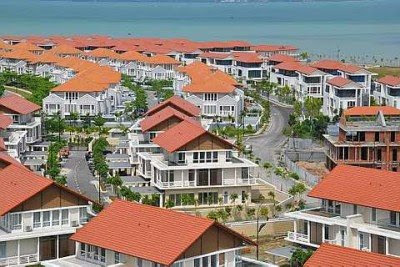 The 76 bungalows, with an estimated gross sales value of RM200mil, were originally targeted for launch at year-end, chief operating officer Ng Heng Phai told StarBizWeek. However, having sold 150 or about 75% of the first batch of 200 three-storey link houses in the first week of launch last month, Mah Sing decided to introduce the bungalows earlier, he said. The units are priced from RM795,000 and sales have since reached 85% for the phase which has an estimated gross sales value of RM200mil. “We expect the value of the link houses to appreciate by 15% before year-end,” Ng said. 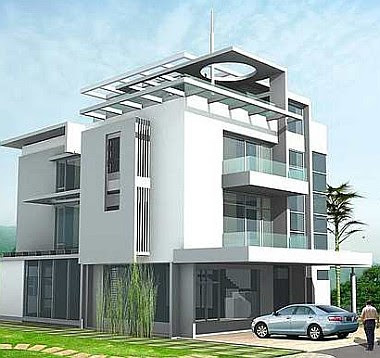 With built-up areas ranging between 5,000 and 8,000 sq ft, the bungalows will be priced around RM3mil each. “The bungalow project, known as Legenda, is a guarded and gated scheme on a 27.8-acre site,” Ng said. Ng said the group was preparing to launch the RM900mil commercial component, Southbay City, on a 34.5-acre site at year-end. “We plan to develop sea-fronting retail outlets. The commercial component will increase the value of the residential properties in the project,” he said. Ng said the group was working with agents to market Southbay Penang overseas. To be developed over five to seven years, Southbay Penang is Mah Sing’s biggest project to date. “Our projects in the country have a gross sales value of about RM3.8bil, of which RM1.35bil will come from the Southbay Penang project,” Ng said. “The projects in the Klang Valley and Johor Baru will contribute about RM1.6bil and RM800mil respectively,” he added. “The bulk of Southbay Penang’s contribution should come in when we launch Southbay City,” he said. A handout image of Seri Tanjung Pinang project. E&O will be launching two new projects this year. Eastern & Oriental Bhd (E&O) group is positioning itself to capitalise on opportunities in the next economic upturn including holding back launches to time for the upturn as well as raising capital that could be used to make opportunistic acquisitions. The group’s RM200mil proposed 1-for-2 rights of irredeemable convertible secured loan stocks (ICSLS) 2009/2019 in late May is part of a two-pronged strategy to raise a total of RM500mil. The money will be used to fund developments, opportunistic acquisitions such as strategic acquisitions of landbank, and general working capital and repayment of financial obligations, etc. The suddenness of the economic downturn in 2008 and 2009 had impacted E&O’s business and strategies Chan said. Under current weaker conditions, the premium niche property developer is focused on “managing the balance sheet rather than being only profit and loss-driven”. In addition to the RM200mil from the rights issue expected to be completed by August, RM300mil will be raised from the disposal of non-strategic landbanks and cash generated from new launches. To date, it has also raised just under RM100mil from the disposal of what it considers to be non-strategic landbanks including a property in the Semantan area of Kuala Lumpur from the unwinding of a joint venture with Selangor Properties. As part of its “value preservation” strategy, E&O has been holding off launches and will only put these developments worth RM4bil in gross development value (GDV) into the market when the economy and demand for high-end property recover. In fact, the company had not launched aggressively in 2007 and 2008, which had shown in its 2009 financial results, given that there was an average two-year lag for the value of launches to be manifested in earnings, said Chan. The group has announced an unaudited RM37.7mil net loss for the financial year ended March 31, 2009 (FY09) compared with a net profit of RM128.9mil for FY08. “But the value of the developments are intact. 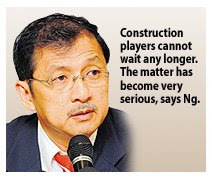 They are deferred but not cancelled,” Chan said referring to the RM4bil GDV of held-back projects. The RM4bil appears to be readily realisable when the market recovers. “These are ready-to-market projects. We have acquired all the approvals,” he said, adding that approvals for property development launches could take about a year. But the upturn may be sooner than expected. The company expects to take two to three years to reduce the high gearing it has built up during the downturn. Meanwhile, it is launching two projects this year. These projects are the 440-unit St Mary service apartments in Kuala Lumpur near the Weld next month and 1,000 units of Seri Tanjung Pinang condos in September. The company expects these projects to bring RM600mil into the company’s coffers. The estimated RM200mil from the rights issue, by E&O’s calculations, will bring down the company’s gearing from 0.8 times to 0.46 times, while the RM300mil from landbank disposal and new launches will bring gearing down to a negligible 0.16 times. HwangDBS Vickers which maintains a “hold” call on the counter in its latest report says of the two expected launches, “We expect the takeup to be slow due to high incoming supply of high-end condos especially around KLCC over the next two to three years. But at the same time, the research house has raised its FY10 and FY11 earnings forecasts of the company by 6% to 18% after factoring in stronger takeups with property sales showing signs of bottoming out on anecdotal evidence. On the rights issue last month, HwangDBS says that E&O will have more working capital to resume launches in the second half of 2009 from the estimated RM2.4bil GDV, which should help to replenish dwindling unbilled sales at RM150mil currently. The research house also opines that concerns about the company’s high gearing “will abate” and calculates that gearing will improve to 0.53 times from 0.83 times at present. “The funds raised will also ease pressure to sell assets at distressed prices – E&O still hopes to raise RM300mil from the disposal of non-strategic landbank,” it says. FOLLOWING the reduction in the overnight policy rate (OPR) by 75 basis points to 2.5%, which subsequently went to down to 2%, banks have adjusted their mortgage rates to competitive levels that are below their base lending rates (BLRs). A few aggressive ones had initiated the reduction in mortgage rates to as low as 3.2%–3.3% while others took some time to catch up. This led to questions on why some banks were not reducing their mortgage rates fast enough. Banks surveyed by StarBizWeek say changes to loan rates were usually not done immediately after every revision of the OPR, as they had to complete several internal processes to consider the impact of any change. Most banks, nonetheless, would revise their financing rates within a week after the central bank announced the changes to OPR which has been kept unchanged at 2% since February. OCBC Bank (M) Bhd director and CEO Jeffrey Chew said while banks tried to respond as quickly as possible, they needed to balance all the factors involved in the pricing equation. “We need to evaluate our overall strategy for running the business, cost of funds, marketing strategy for attracting new customers while retaining the existing ones, as well as sales and administration costs,” he says. Alliance Bank Malaysia Bhd group CEO Datuk Bridget Lai says factors determining the pricing structure included the customer’s risk profile, collateral, loan tenure and market competition. Ultimately, the bank’s goals are to protect the quality of its asset portfolio while driving up productivity, efficiency and service levels, she says. RHB Bank head of retail banking Renzo Viegas says that upon an announcement of a cut in the OPR, the bank’s central treasury together with related business segments in the group would immediately carry out their analysis, following which the new rates would be keyed into the system. “Changes are overnight with all the loans that have rates pegged to the BLR revised. Concurrently, the website and all point-of-sale interactions within the bank are also updated,” he adds. While floating rates pegged to the BLR are easy to revise, given that adjustment is automatic, he says the fixed rate module is tougher due to profitability issues, as these fixed rates are already built into the pricing structure. 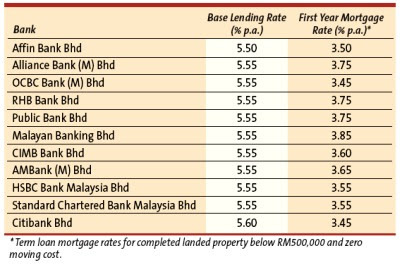 Both RHB’s conventional and Islamic banks revised their respective lending rates within a week after Bank Negara’s monetary policy change. According to RHB Islamic Bank head of asset based finance group Zulkhairi Zabiri, property developers’ discounts, coupled with banks’ cheap financing, were attracting individuals to buy properties. “We do see an upward trend in demand for this segment and we observe a similar trend for commercial properties,” he says. Chew of OCBC concurs. He says companies are less sensitive to changes in the cost of funds as their need for loans depended more on demand for their products and services. “If there’s strong demand, businesses tend not to mind slight increases in interest costs. The factors include credit availability, turnaround time and service delivery,” he says. This was evident last year when most banks recorded significant loans growth despite the BLR being at a higher rate of 6.5%, as the business environment was conducive with individuals spending and companies investing. Although the rapid pace of expansion and the sheer size of companies have been idolised by many western economies, the latest global financial debacle that brought down many industry giants in the financial, automobile and manufacturing sectors, shows that being big does not necessarily mean greater efficiency and profitability. On the contrary, many of the companies that are still staying afloat and have strong financial standing are the ones that have not gone on an overzealous expansion spree to flex their muscles around the various continents. Instead of diversifying into various business sectors to prove their mettle, these companies have remained steadfast in what they do best and stayed focused on their areas of competencies. By keeping to what they know best and not being caught up by the “borrowing and expanding game” that decapacitated most of the felled giants, it goes to show that companies should not expand just for the sake of expanding, or in the name of globalisation. It looks like globalisation will have to take a back seat for a while as many of these “once huge” companies and conglomerates are still struggling for their survival. The latest shake-up of the global economic and financial systems should be taken as a lesson for Malaysian corporations to avoid the temptation of growing too big, too fast – the path travelled by their western brethrens and one of the major contributors to the current financial quagmire. Luckily for Malaysia, many of its companies, including property developers, have not gone overboard to expand into unknown territories overseas. Those who have done so have limited their exposure to markets that they are familiar with and only after due market intelligence studies are conducted. Of course, there are some companies that have been “caught” after paying premium prices to take over some local companies for their offshore expansion. There have also been instances of property companies which went on a huge expansion binge by leveraging on bank borrowings to acquire huge landbanks and got caught when they bet on the wrong growth corridors. These companies are still paying heavily for their mistakes after investors deserted their stocks. Turning the table on these quick-fix expansion model and going back to the organic growth model that values prudence, manageability and efficiency looks like a better option these days. Nurturing a company by focusing on its core competitive advantages and growing organically by harnessing its human resource expertise will be much healthier than blindly expanding into new areas without the right market knowledge. Good property companies should be trendsetters in terms of product quality, innovative designs, pricing and service excellence. Having a strong brand name and proven business model will certainly add value to a property company and raise its attractiveness in the eyes of buyers and investors, if the company is listed. Property buyers are increasingly savvy these days and are more careful of which developers they buy from to ensure good quality products and timely delivery of their property. Developers that are reputable and well regarded for their product quality and timely delivery usually have a strong following of loyal buyers. Moreover, projects that are offered by these developers usually command a higher price premium over projects by other developers. Although much effort and hard work are needed to build a strong reputation, all will be worthwhile at the end of the day when these efforts are translated into loyal buyers and good product take-up rate. Those who have made it will be the ones to survive any bad glitches thrown their way, like the latest one that is brought about by the global financial meltdown. Athough the market is likely to remain lacklustre over the next few months before it bottoms out later this year, industry players should harness their skills and competitiveness to prepare for the market upturn. ● Deputy news editor Angie Ng believes much can still be done by property players to lift the industry standards further and for them to vie for a bigger share of the global real estate market. CONSTRUCTION players want the government to immediately exempt imposition of the new stamp duty as the sector is grappling with escalating cost. "We cannot wait any longer. The matter has become very serious now," Master Builders Association of Malaysia (MBAM) president Ng Kee Leen told newsmen in Kuala Lumpur yesterday. MBAM said the exemption should be for all service agreements including construction contracts of all types including consultancy contracts, operations and maintenance contracts, maintenance contract projects, and facilities management services contracts. MBAM feels that construction contracts are not service agreements and therefore do not fall within the scope of "services" under Item 22 of the First Schedule of the Stamp Duty Act 1949. On Wednesday, Ng told Business Times that the amendment to the Stamp Duty Act, which came into effect on January 1 2009, has resulted in construction cost rising up by 1-2 per cent. As a result, ordinary service agreements are slapped with 0.5 per cent stamp duty of the total contract value, whereas previously the stamp duty on an ordinary service agreement was fixed at only RM10. MBAM along with other construction players including architects and consultants hope to voice their grievance during their annual dialogue with the Ministry of Finance on June 11 2009. He said a memorandum was forwarded to the Ministry of Finance in April but no action has been taken so far. Ng said the combined effect of stamping all agreements at 0.5 per cent of a contract value is exponential since the nature of the construction industry has multiple levels of subcontrac-ting works. "MBAM believes that the imposition of the additional stamp duty on construction contracts is inconsistent and counter productive to the policy and objectives set out in the stimulus package plan to help drive the economy out of the turbulent financial crisis by boosting the construction industry which is recognised as an important growth engine in the economy," Ng said. He said many construction contracts to be executed were negotiated or awarded prior to the amendment where the project costing did not include the additional stamp duty. "Imposing such much heavier stamp duty may cause serious cash flow constraints and reduced margins for the contractors and consultants in an already highly competitive market and therefore impact the viability of projects committed," Ng added.